If David Bowie could be summed up in one word, it would be "curious". He was not an academic but he had the inquisitive mind of an intellectual. The world to him was a mutable place full of exciting new ideas begging to be explored. He was - in that regard at least - the Picasso of pop: an innovative, visionary, restless artist who synthesised complex avant garde concepts into beautifully coherent works that touched the hearts and minds of millions. He arrived on the scene in a blaze of orange hair and pastel make-up and transformed early 70s rock-n-roll from being a macho-fest into something far, far more nuanced and strange. His world was one of alienation and ambiguity, misfits and Space Oddities. The older generation were bemused, the rockers dismissive, but teenagers in bedrooms from Cornwall to Carlisle were transfixed. At last here was somebody who understood them. He made plain his artistic modus operandi in 1971 in the song Changes: "Turn and face the strange," he sang. "Just gonna have to be a different man." And so he was, from Ziggy Stardust to the Thin White Duke, David Bowie became transfixed by the idea of creating character after character in an act of arch pop post-modernism. His motif was not fame, fortune or approval, but a compulsion to share his perspective with the world. 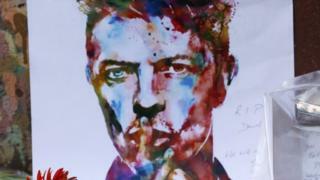 David Bowie became a pop icon, but underneath all the mascara and make-believe was still a man called David Jones from south London: an ordinary chap who did extraordinary things.